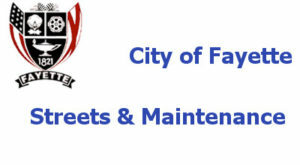 The mission of the Street and Maintenance Department is to provide and maintain the streets, public grounds and facilities of our city. It strives to provide a high service level to the citizens of Fayette. Their efforts are designed to enhance the lives and safety of citizens and the quality of neighborhoods and the business district. The department oversees the installation and maintenance of all traffic lights, signs and pavement markings. Coordinating special events are also part of their service as they are responsible for the setting up and taking down of necessary support items.